Posted on Wed, Feb 3, 2010 : 10:56 a.m.
Red Trim Door by artist Holly Kreag, one of twelve doors featured in Saline's Fairy February Treasure Hunt. It's a Fairy Door Treasure Hunt in downtown Saline. Thanks to the Saline Downtown Merchants Association and 212 Arts Center in Saline, those piqued by a little adventure and a lot of whimsy will enjoy participating in this magical, month-long event. A select group of merchants in downtown Saline is participating in the district's first ever Fairy Door Treasure Hunt. Fairy door hunting has become a bit of a tradition for visitors of Ann Arbor. I know my son still scurries to find them at various places, whether or not he has seen them a dozen times before. 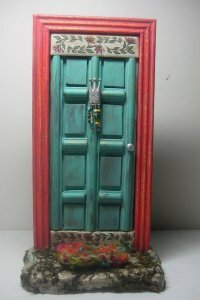 What is it about fairy doors that is so appealing? Is it the size that stirs our imagination? The fact that they don't open, leaving us to imagine the wondrous activities taking place inside? Whatever it is, the Saline Downtown Merchants and 212 Arts Center are creating a little magic of their own all month long. Here is how it works. Visitors pick up a Fairy Stamp Card at participating shops downtown. There are twelve different fairy doors hidden within 12 different businesses. Once the doors are found, the merchant will stamp the card. Fill the entire card with stamps and turn it in to be entered into a drawing. The winner will receive an amazing basket full of downtown goodies from the various merchants. The fairy doors themselves, were each crafted by excellent artisans of the fabulous 212 Arts Center in Saline. (This is a place worth checking out too, while fairy hunting). The doors are all unique, made with different materials and reflect the artist's individual interpretation of what the entrance to a fairy's world should look like. For those who haven't been to Saline's shopping district before, this is a great chance to talk with the kinds of shop owners who still know their customers by name. There is a charm here, a very welcoming feel with wares both simple and sophisticated. And a bonus...Downtown Saline has free parking in each of four lots, and free street parking as well. You'll find downtown Saline at Michigan Ave. and Ann Arbor- Saline Rd. So if you're looking for a winter activity to do with your family on a weekend or afternoon, head to Saline. Just a note, some merchants are closed on Mondays!